‘Would you like to try the Bergerac red or the Montbazillac white?’ asked the wine shop owner. ‘Please, try as many different ones as you would like,’ he offers enthusiastically. The option of being a cheap drunk in France is frequent, but none so joyous as the breakfast option in the Saturday market in Figeac, an evocative Romanesque and Gothic medieval town. Where else can you openly sample wine at 9am and not feel the least bit guilty? With the summer sun beaming down and the heat increasing, a refreshing drop of white wine is very tempting. If I carefully reach to the stalls behind, I could sip a little while sampling some foie gras, a few cuts of French sausage, a little of the gorgeous, local Cantal Vieux cheese, some richly reddened fresh strawberries and finish off with a sample of the famous Armagnac liqueur and any number of exquisite pastries. This morning market puts a new take on the term bed and breakfast. 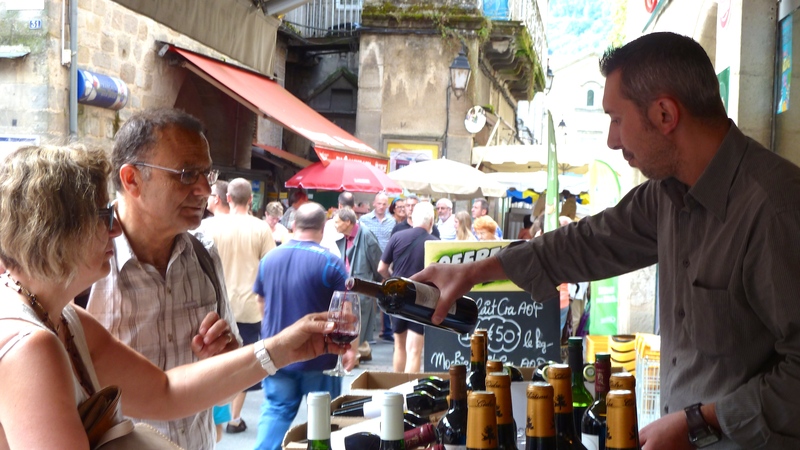 The Saturday market in Figeac is the largest in the entire Midi-Pyrenees region. Every week you’ll hear the cries of the market stall owners celebrating their locally produced food, each competing for your taste buds’ approval. And well apart from the huge selection of the edible, there are so many local artisan items to add to your Christmas list that the only way to fully appreciate this market is to come early, hungry, with cash in hand and loads of empty bags to port all your French-inspired goods back home.